Cannot unsee - no, wait, can! Much as we love checking to see exactly when other people read our important messages and divining from that where they are and what they are doing and who they are with and why they haven't responded instantly, when it comes to other people seeing that we've read their Facebook messages we're less keen. 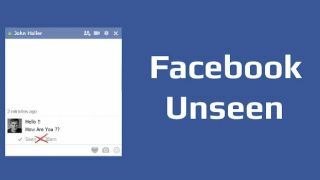 The answer to at least half of our prayers is the Facebook Unseen Chrome extension, which blocks Facebook read receipts from being sent so your correspondent won't know whether or not you saw that request for money. You can even set it so you can't see if the other person read your messages, if you're into that kind of digital self-flagellation.